Don't you sail at Sandbanks? Only sailed once, there, it's quite a drive for me, but that doesn't seam to stop my Montreal windsurfing buddies, that go crazy when they call for wind there! Don't hold your breath--It's going to be a couple years before I get a new van. "Fluffy" runs great since I had the engine & trans re-built a few years ago, and Debi got a 2014 Accord Sport a few months ago, so we need to recover financially first. BTW, the Accord is frigging amazing!!! That's funny, his nickname is Gtj101 and for some reason, people often confuse us on the net. This guy is probably one of the best (if not the best) windsurfer in Quebec, while I would probably rank #3789.
check him out on his homemade windski! He sure is amazing to watch. You might know Ilan, JF, Steve Mallet....they all come to Sandbanks regularly. You should come out there more often, the place rocks, and it's always nice to have the Quebec crowd there. As for the van... spray the whole fan in a satin clear coat, and get the graphic designer for Makani fins to design you some cool graphics. I love the graphics on all their fins and T-shirts. Then remove the springs and drop it on some air bags and drop that sucker down to the ground. The van looks great ! I am still debating with myself if I will go to Cape Hatteras or Corpus Christie this spring. Last year was my first time in OBX and I got 12 out of 14 days, 8 of them being 4.0-4.7 days. But it may have been beginner's luck. Right now I lean towards Texas, renting a condo on a monthly basis is cheaper and I prefer the really flat water of Bird Island compared to the Pamico Sound of Hatteras. Also, it's not that I have a thing against my own kind, but when I travel, I like to meet people other than the ones I see all the time at my local spots. Hatteras is so Quebeker . Guy, is this vehicle destined for Baja or Texas this year? 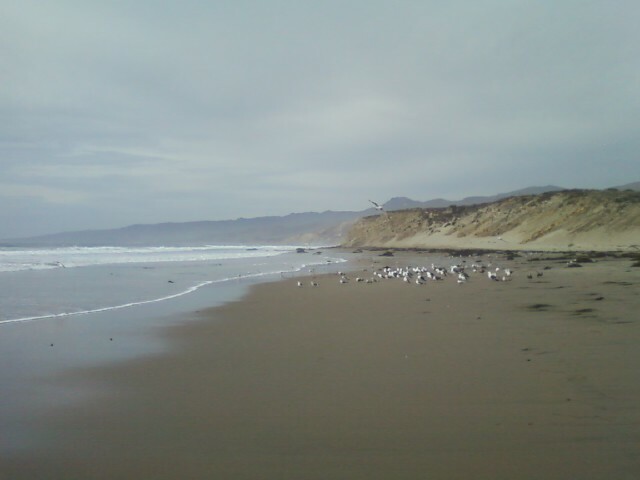 I opted to stay nearby so I visited the Oregon/California coast instead down as far as Jalama Beach. Tolerably warmer, with the water starting to feel like no-booties-no-gloves at about Morro bay/Cayucas. Little wind and small surf so didn't get much more than beach combing. Very beautiful coast, great weather and a possible winter haunt! Jalama looking north; surf coming in but no wind today; beautiful spot with a county campground. 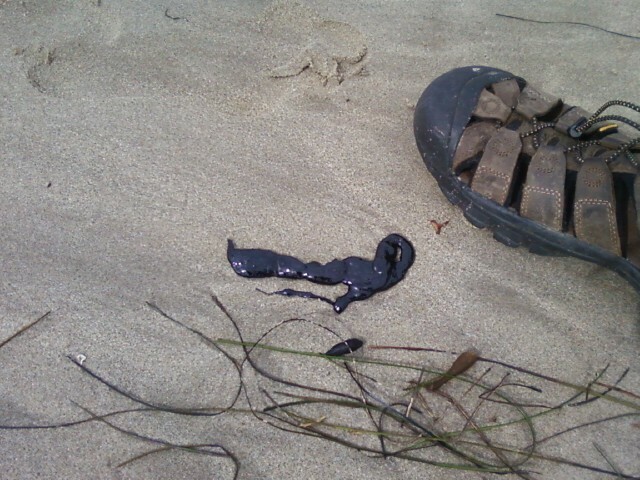 Jalama Beach tar balls; have other folks experienced this at Jalama?